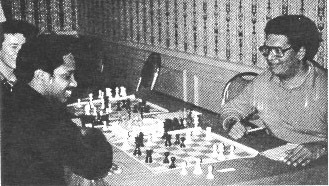 Pictured above is NM Charles Lawton (L) analyzing with FM Morris Giles (R) after their last round encounter at the 1982 Midwest Masters Invitational in Chicago, IL. This game showed the fighting spirit of both players. Neither Giles nor Lawton are currently active. FM Giles had nearly earned a 2500 U.S. national rating at one point despite his ultra sharp style! Giles was mild-mannered, soft spoken, but had the heart of a lion over the board. Giles' tenacity was illustrated when he brilliantly mated GM Walter Browne in the center of the board. The game appeared in Chess Life magazine. It will appear in a future issue of The Chess Drum. Lawton, a Missouri native, had been a steady fixture in Missouri chess with the likes of IM Michael Brooks (also in the picture). He had a very aggressive style and enjoyed playing offbeat lines. I played him a blitz set during a tournament (in the late 80s) after which the affable Master told me he would stop playing actively. His last rating was 2363, published in 1991. Pictured above is (now GM) Maurice Ashley analyzing R.O. Mitchell's game (with his seated opponent) at the 1989 U.S. Open in Chicago. Kimani Stancil looks on while Ashley (standing left) makes point to Mitchell. 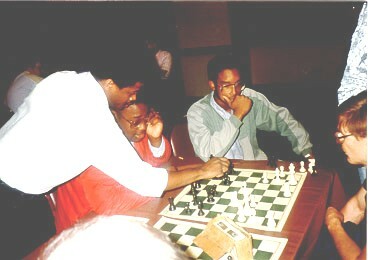 Both Stancil and Mitchell were competing in the Denker Tournament of Champions which ran concurrent with the U.S. Open. R.O. Mitchell was a rising star in U.S. chess and came from nowhere to win the U.S. Junior Open in 1990. Stancil, also a young star in this picture, earned his Ph.D. in Physics from MIT in 2002. Photo by Daaim Shabazz.